This was the first thing I grabbed, I think while people were chatting about the food I was already grabbing a bite. All the flavors were just right, no overpowering single taste. Perfect balance of flavors, I specially liked the cheese and the toppings though the overall taste experience was held back by the crust. The crust was just ok.
Grilled chicken, crunchy bacon bits, fresh tomatoes, onions and cheddar cheese. Really good! I love the subtlety of the ranch flavor over the chicken taste. I liked this much better than Super Papa’s. Reminded me of Corona Chicken Salsa from Yellow Cab. 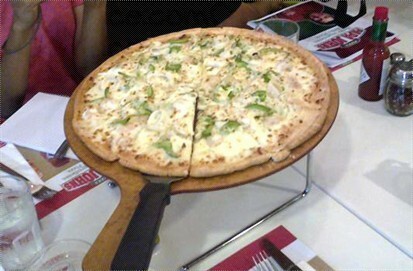 It can stand its ground against the other pizza chains’ chicken offerings. Juicy plump shrimps and calamari, fresh green peppers and onions with their signature garlic sauce. Mouth-watering. Everyone enjoyed this one, I observed that they liked it since it was the first to go. Hehehe. Onion rings, chicken strips and potato wedges. A perfect way to start the dinner. Yum! 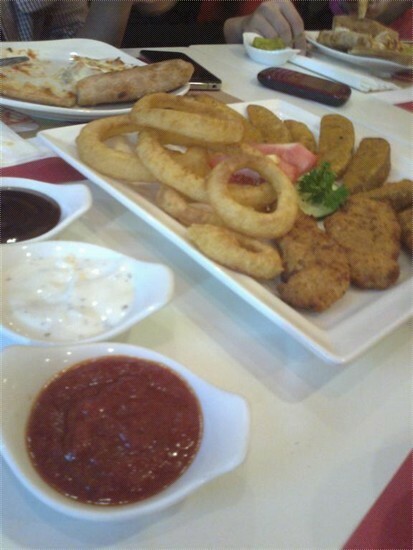 I love the onion rings, huge slices and really crispy. I noticed how they served this with their food. I was intrigued by the jalapeno. Tried a little and then I chewed on half, it was really spicy and really good. Used this on my pizza and added some more dried chili. I love my pizza with a lot of kick! Wow! What more can I say? 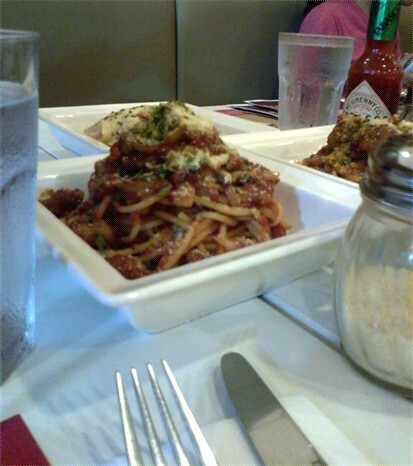 They just spread it out in front of us, I’m a fan of meat sauce so I tried the bolognaise. I love it when the meatiness is really there, infused in the sauce and the pasta. 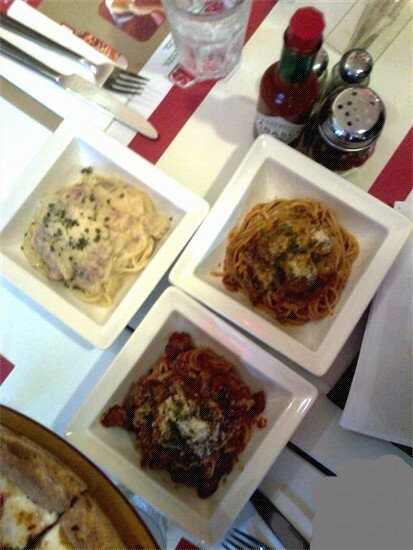 I got that with their bolognaise and the meatballs was pure heaven. I stuffed myself with a ton of this! Really really good! 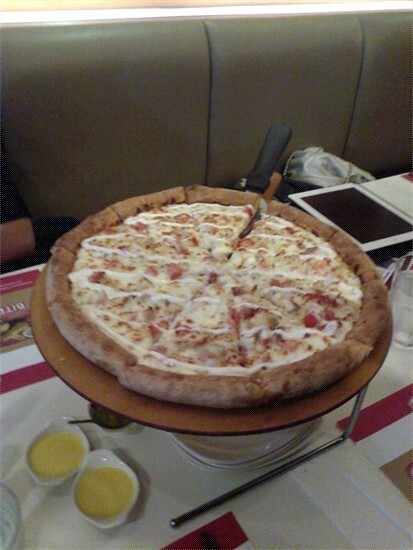 One thing, the portion is a bit small. I guess it’s for single serve only. Well, I get a little selfish when I like the meat sauce pasta. Hehehe. What it was before it became empty. What an experience. Papa John’s may not be the BEST pizza place but it can compete well with the more established pizza chains and is reasonably priced. Pizza lovers should give it a try and you’d be surprised at the selection and quality that they offer. 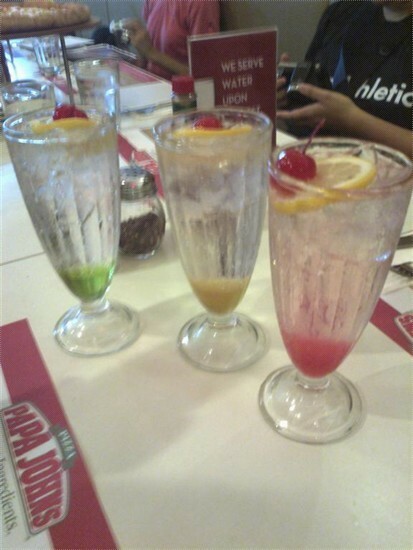 Green apple, pink grapefruit and passion fruit. 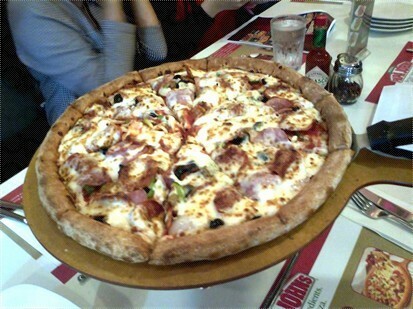 A trademark of any pizza joint, commonly seen in pizza places in the US evokes the Americana diner feeling. Super Papa’s. 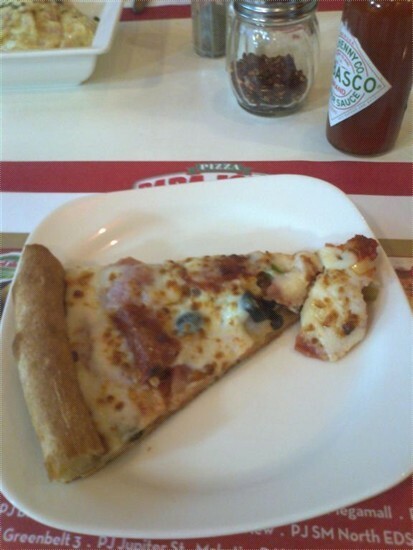 This can go head to head with Pizza Hut or Shakey’s and has a great fighting chance, everyone who wants a good pizza experience should at least try this once and you might find it to your liking. The perfect way to end a good meal. The chocolate cake was moist and tasted great, just the right amount of chocolate taste and the sweetness is just right. 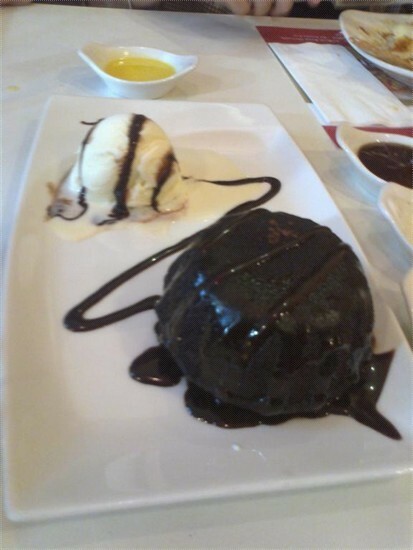 Plus, there’s a sweet molten surprise in the middle coupled with the ice cream. 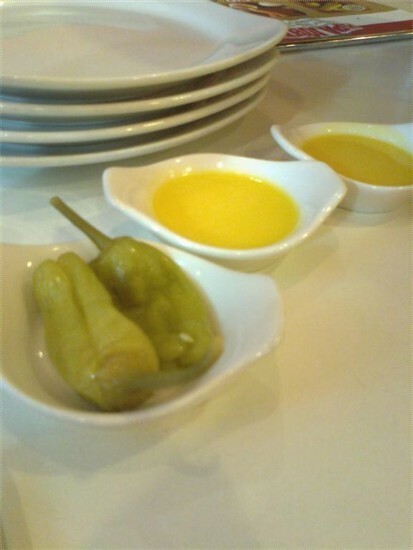 A great gastronomic experience that I wish to repeat again. Papa John’s was a pleasant surprise. I thought it would be a stuffy place but when we ate there it provided a homey and casual dining experience that reflected the feel of great American diners where you could just bring your family, eat good food and have a great time. I recommend it to every pizza lover’s out there to try as you might find your own personal favorite that may make you come back over and over again. 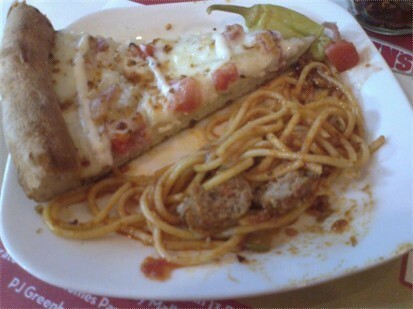 This entry was posted in Makati, Pizza / Pasta and tagged Italian, Makati, Pasta, Pizza by manilafoodblog. Bookmark the permalink.